If you're familiar with the concept of toning shoes, then you probably associate this type of footwear with big, chunky, rocker-bottomed soles. That is certainly the look that you get from both Skechers and Masai Barefoot Technology (MBT) shoes - two of the market leaders. Whilst this style is very popular, you might almost say prevalent, it's far from all that that's available on the market these days. Reebok have their EasyTone range, which uses airpods to generate the imbalance required to make toning shoes work. FitFlop also have a much thinner, wedge type sole, made of three different material densities, which isn't anywhere like as thick as either MBTs or Skechers Shape Ups. Reeboks tend to look like high tech, sporty, fitness shoes. That is exactly what they are of course. FitFlops tend to be much more fashionable and look, in some cases at least, like colorful, chic, fashion shoes. They have a number of different styles that are pretty much unrecognizable as toning shoes. The FitFlop Dué Ballerina "flats" for example, would pass for a pair of smart, trendy shoes. You could wear them to the office, or even on a night out, and nobody would have the foggiest idea that you were wearing toning shoes. Another great benefit of FitFlops, is how amazingly comfortable they are to wear and to walk in. That's because the special toning sole also provides excellent support, maximizes the contact area between the sole of the wearer's foot and the sole of the shoe and reduces the average pressure exerted upon the feet when walking. That's why most people consider that FitFlops are very comfortable to wear. And it's not just a matter of being fashionable. The combination of good looks and comfort means that you will be able to wear your FitFlops more often - and that means that you will get your money's worth from them (plus you get maximum toning benefits). FitFlops are probably most famous for their sandals - but they have many other styles in the range these days. The FitFlop winter boot collection is another example of footwear which looks good and is very comfortable. they will also keep you warm and cozy when the weather turns cold. 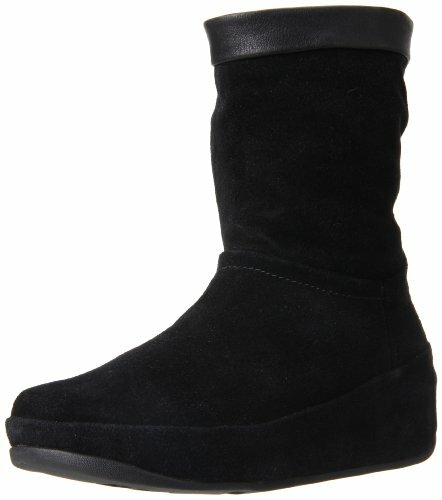 You would never know that these FitFlop Crush boots have a special toning sole.